The Cover: I enjoy this cover. I think it is a very lovely cover- I love the colors, the font for the title and the girl. I am happy that they actually matched up the girl with what the story says she looks like. I am not sure why she is in a flowy dress (that doesn't match the book at all), but I do like that she at least has the right hair color. The Characters: The characters are not what I expected. I really became attached to both the main characters and the sub characters. Carey has a way with her characters- they become living and breathing in this book. She made me care about them and want them to be healthy and survive. The Story: The idea that orphans are being used for breeding and slavery was a shocking and very interesting component to the story. Although we really don't get to see much of what is actually happening to people in the city, we get to see what is happening on the outside. This part of the story really made it stand apart from other dystopian books. 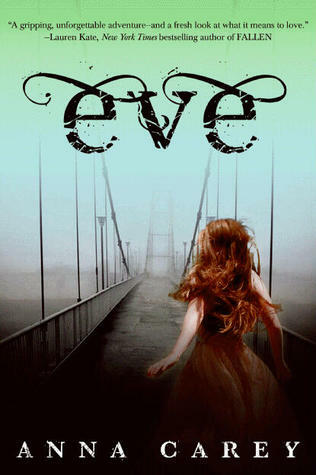 Eve's journey to California is slow and grueling and in the process she makes a transformation from needy teenage girl to survivor. The ending makes it obvious that this is a series (and the second book comes out very soon). All in all, I enjoyed this book. I struggle with dystopians as a whole (mainly because I struggle with finding one as good as Divergent), but I thought this book stood out as being different and had a very interesting storyline. If you are a dystopian fan- I think this is a solid book pick. Thanks for this review. I think it sounds interesting! Great review! I've also seen very mixed reviews of this one. I think I'm going to try it anyway, because I really love the idea, and Anna Carey herself is a sweetheart. Awesome review! This sounds good, I'll have to get it!